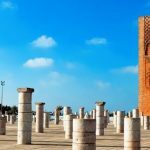 This tour of 5 Days/ 4 Nights from Marrakech to Fes takes you in a wonderful journey through the high Atlas Mountains, Berber Villages, Kasbahs, Gorges, Canyons, Sahara Desert (Erg Chebbi dunes), Desert Villages, Middle Atlas Mountains and Cedar forest. 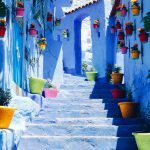 Today, we pick you up from your Hotel in Marrakech, and departure to Telouet over the mountains of high Atlas passing through the Tizi N’tichka pass (2260 m in altitude), visit the Kasbah of Pasha Glaoui in Telouet and stop for lunch in a local restaurant. In the Afternoon we will drive to Ait Ben Haddou along the Ounila valley with its Berber villages. You will visit the Kasbah of Ait Benhaddou then continue to Ouarzazate. 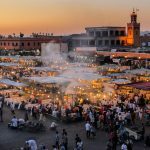 Dinner and overnight at the hotel in Ouarzazate. 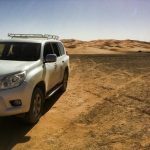 Day 2: Ouarzazate-Skoura-Kelaa M’gouna(Roses)-Dades Gorges-Boumalne-Tineghir-Todra Gorges. This morning after breakfast in the hotel, Leaving Ouarzazate towards Skoura where we will visit the Kasbah of Amredil, a beautiful Kasbah situated in the palm groves “Route of one thousand Kasbahs”. The journey continues through the Valley of Roses then cross the off-road with the possibility to visit nomad family living in caves. You will visit the Dades Gorges and see the rock formations. After that heading to Boulmane Dades and have a break for lunch. In the afternoon, we continue to Tineghir then to Todra Gorges to enjoy its marvelous views of Canyons. Day 3: Todra Gorges – Tinejdad – Touroug town – Erfoud – Erg Chebbi (Merzouga: Desert). This morning, you will walk around the Palm Plantations and enjoy the panoramic views of Todra River. Later on, we drive toward Tinjedad for a lunch meal on a local restaurant. 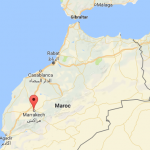 You will pass by several villages such us Touroug (Berber village) and El-Jarf before reaching Erfoud. You will visit a local fossil craft workshop. 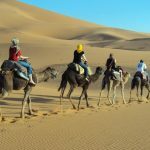 After that you will continue to the captivating dunes of Erg Chebbi, these dunes are called also Merzouga Dunes. Arrive to the hotel and get ready for a camel trek for an hour and half to enjoy the sunset. While on the back of your dromedary, you will continue to the camp or an overnight in traditional nomad tent. 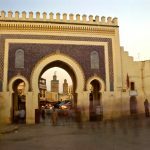 Today you will travel to Rissani and investigate the local market (Souks). 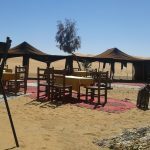 Later on, you will depart to Errachidia via Erfoud, Aoufous and the valley of Ziz then stopping for a panoramic view of the oasis of Aoufous in the Tafilalte region. Continue to Midelt across the pass of Tizi N’talghamt and have lunch break. 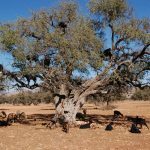 After lunch you will be driven to Fes (the medieval city) via the Cedar forest near Azrou and the mountain of the middle Atlas with the possibility to see the Barbary apes (monkeys). You may have a stop in Ifrane (Known as the Switzerland of Morocco) before arriving to Fes. 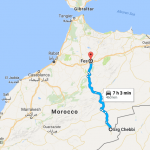 Drop you off in your provided address in Fes.